‘Mary did you know’ is a popular Christmas song. Listen above. But honestly, can you imagine? You’re a virgin, but now an angel tells you you are pregnant. Not just pregnant, but you will give birth to the most important person to walk the earth. Can you imagine what she went through mentally? The stares + awful insults alone. Fear that Joseph would leave her, because back then what guy would stick around. She didn’t tell the angel “I actually have my own plans of life going on right now, + this just doesn’t fit in.” “Can you take this away from me?” I’ve tried to put myself in her shoes to have a glimpse of what her thoughts or actions were like. I can’t, its impossible. My life has been a lot of unknowns + unplanned paths, but I’ve had freewill to make choices that lead me to paths. Mary however was innocent. I knew who my doctor would be + the hospital I would deliver in. Mary had no clue. And if she did make plans they got ruined because they had to travel to Bethlehem for a census. She was in Nazareth, which was around 70 miles away. Just to put that in perspective. If I walked from Heber Springs to Little Rock its 63 miles…Can you imagine walking to Little Rock?! Ladies can you imagine being in the homestretch of your pregnancy + know you have to travel that far? No big deal if cars were around, but they weren’t. 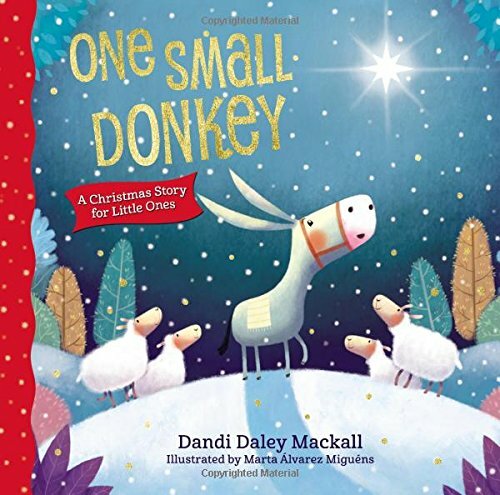 Ezra has this cute Christmas book called “One Small Donkey” by Dandi Daley Mackall. In the beginning the book states that no one knows for sure if she walked or rode on a donkey, but some assume she rode on a donkey. The story acts as if she did ride on a donkey. This donkey was hoping he could be important like the big, strong stallions. Little does he know how important his job was; the significance of whom he was carrying. So if this is true that Mary had the ‘luxury’ of riding on a donkey + not walking the whole way, can you imagine that bumpy ride? Riding a horse for any amount of time can make your bottom sore. Let alone being at the end of your pregnancy. Being pregnant you are already sore down there with no help from riding a donkey. And if she walked the whole way she took “walk that baby out” to a whole new level. I wish I could read her journal from back then – “ painful Braxton-Hicks contractions the whole way”. Just kidding, she probably didn’t complain. I would have complained the whole way. Honestly I would have probably tried to talk my way out of even going on the trip. But she did it. Now she’s in Bethlehem + there’s no hotels. Oh I would have been yelling from the rooftops until someone felt bad enough and let me sleep in their bed. Also cue the questioning to God – “Why did you do this to me? Don’t you see I am pregnant with YOUR Son that I didn’t ask for? !” Not Mary, I need some grace + faithfulness lessons from her. Now she’s in a smelly, dingy, dark stable with nowhere to put her newborn. I was in a hospital with the comfort of air control, the choice of medicine, the safety of doctors + tools. I had choices, Mary did not. Now as a mom I can imagine some of those thoughts. I often think about whom my kids will grow up to be. Who they will marry? Will they follow God’s path for themselves? Will they change hearts for God? Luckily I have open communication with God + have the pleasure of putting my prayer requests at the cross. But can you imagine what her prayers would have been like? Her Son was the Messiah. She had no idea what his birth would bring. She had no idea about his death + what his death would mean. People loved or hated him. Wanted to worship him or kill him. There was no in-between. Can you imagine the constant fear she was in? I truly can’t fathom. I would want my kids to live in a cave. If you are feeling lonely this holiday season you aren’t alone. They say holiday season, even though it’s suppose to be the most joyful time of the year, can actually be the worst for some. Death of family members or broken families. Guilt. Shame. Regret. The list goes on. The world tells us how many gifts we are to give, how much Santa is supposed to bring our kids, + it is never enough. Each year the list grows + the meaning of Christmas shrinks. They tell you, you’ll never have enough money, enough time, or enough joy. I just want you to remember…Jesus is ENOUGH. We will never need another gift outside of him! The latest, hottest gift will never trump Jesus. But, they will remember the mood you're in + how you made them feel. So don't sweat the small stuff, just be joyful + give love. JESUS was + is our gift. He is a gift that keeps giving. Happy Birthday, Jesus! 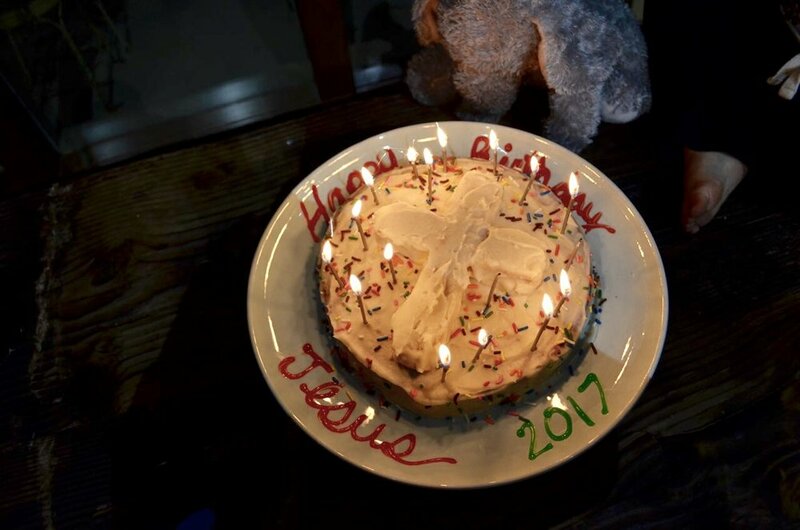 Our favorite way to explain this to our kids is making Jesus a birthday cake. We sing happy birthday to Jesus + Ezra blows the candles out. It’s my favorite tradition. 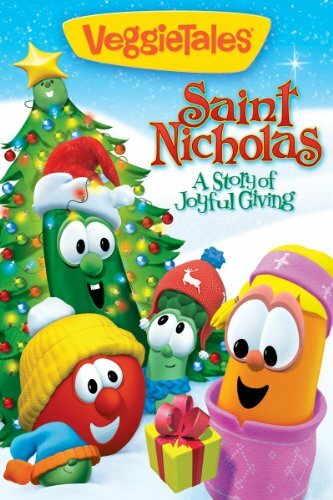 + our favorite Christmas movie explaining Saint Nicholas.